On the journey from hunter-gatherers to investment bankers, we have become more dangerous to one another. 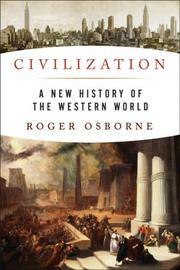 Osborne (The Floating Egg: Episodes in the Making of Geology, not reviewed) set himself a daunting task—to confine to fewer than 500 pages the sprawl of western history. The result: vast historical events and supreme personalities merit only sentences or paragraphs. The author begins with one of George W. Bush’s statements after 9/11 about the choice between civilization and chaos. Osborne wonders, What is civilization? He answers that it’s a narrative we tell ourselves about ourselves, and he concludes that our current narrative “is simply not credible.” The author highlights familiar historical events and characters: Pericles, Socrates, Julius Caesar, Jesus, Charlemagne, Machiavelli, Martin Luther, Cortés, Galileo. He recognizes the immense influence of Christianity on western culture, but he may put off non-Christians with his presentation of Jesus Christ’s ascension into Heaven as fact rather than belief. He very broadly traces the contribution of artists and writers through the ages and notes the great influence of African-American musicians on the culture of their country. (Women, however, have a very minor role here.) Osborne—an Englishman—blasts the U.S., most notably for what he calls the genocide of Native Americans and for slavery and its aftermath. He believes our evolving culture of militarism and our belief that our political systems are superior to all others are among the world’s great dangers. The paradox he sees: The more rational we try to be, the more deadly the result.